Earlier topic: Good proof press for halftone? 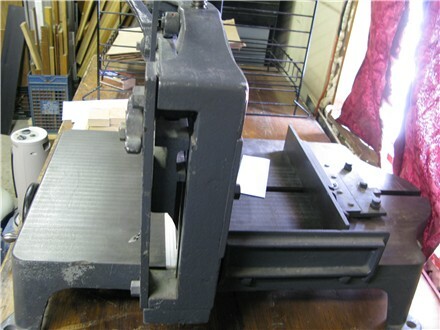 There is one identical for sale currently on eBay under “vintage paper cutter”, maybe that seller has some knowledge. There is a name/word cast into the front of the knife carrier. What is it? That reads ‘utility’ - I’m sending an e-mail to the seller on e-bay, hopefully he can shed some light on this for me. 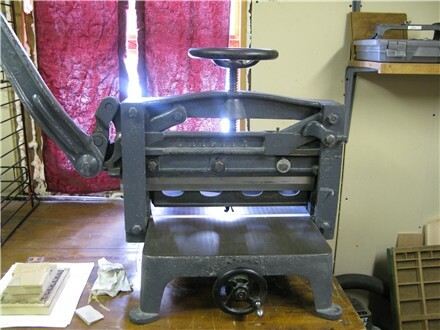 His has a picture of the name casted on the cutter ‘Pavyer Printing Machine works St. Louis MO USA’ Thanks! I just found this post. I’m at least two years behind on this discussion, but I have the same cutter. I bought it a couple of years ago, so it might have been the one on ebay. I just talked to the company, which is still in business, to try and track down a new blade for this machine. Did you ever find out any more information? I don’t know where you are, but Mid Atlantic Knife in Ashland VA can probably supply a blade, especially if you already have one to copy. They’re not overly expensive and will ship. They’re also very good for sharpening blades of all sizes. Wow, I was surprised to see a response on this post after 2+ years! I gave up on trying to find more info on my knife. It works well so I’m not too concerned about the history. I received 2 blades with my knife that were in like-new condition. For sharpening I go to Valley Knife in West Springfield MA, they have a fast turn-around and are nice people. I didn’t really have much luck contacting Pavyer directly, please let me know how you make out - I would love to get an owner’s manual for it if possible!